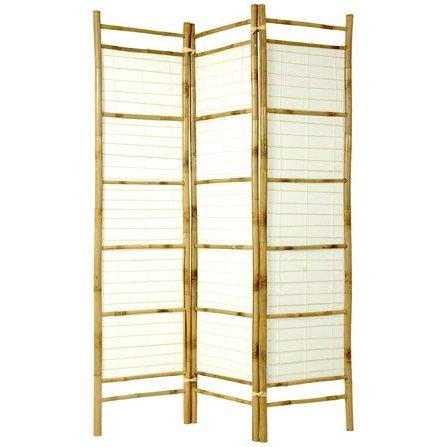 Add a light, tropical influence to any décor with our Burnt Bamboo & Rice Paper Shoji room divider. Panel frames are crafted from tough, lightweight, kiln dried bamboo pole. Stitched matchstick cross pieces create a slightly primitive, handmade feel. Hinged with split bamboo loops. Available in 3 panel size only. 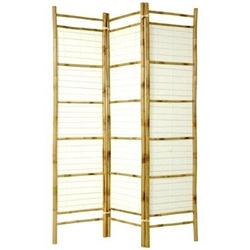 Please note, some splitting in kiln dried bamboo pole occurs naturally and does not affect the structure of the screen, giving the screen a rustic look. Each panel measures approx. 72" tall x 17 ½" wide 1 ¼" thick. 3 panel screen measures approx. 53" wide flat, approx. 45" wide slightly folded to stand upright(AS SHOWN).